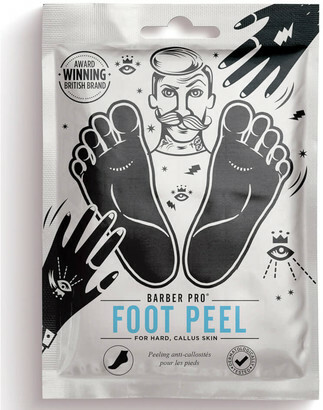 Pamper your feet from heel to toe with the BARBER PRO Foot Peel Treatment; innovative dual-layered booties to help remove hard skin and calluses. Powered by Salicylic Acid and an advanced complex of 16 botanical and fruit extracts, including Lavender, Rosemary and Gingko Biloba, the revitalising treatment renews feet for restored softness and hydration. Dermatologically tested. Against animal testing. Free from parabens, mineral oils, lanolin and petroleum.